My family kept sea anemones when my son was a little boy. I bought a water pump made in Italy. The specifications are as follows. I tried filtering water in an aquarium tank. I used a 250mL PET bottle as a filtering container. I made an inlet near the bottom of the bottle.I packed some plastic wool. 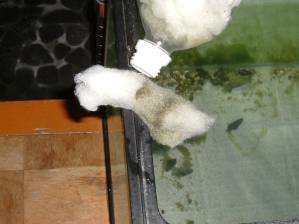 The flow disturbs water at the bottom of the tank. 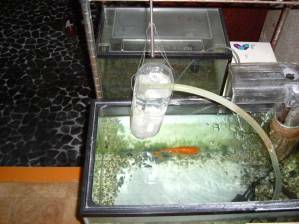 The photo "Hanged PET bottle" shows that the water flow pump works. The photo "Wool at the bottle of neck" shows working filter. Mess concentrated the neck because I packed the wool tight a little.